* denotes "seen during migration"
Click here to download the Birding Trail Guide. 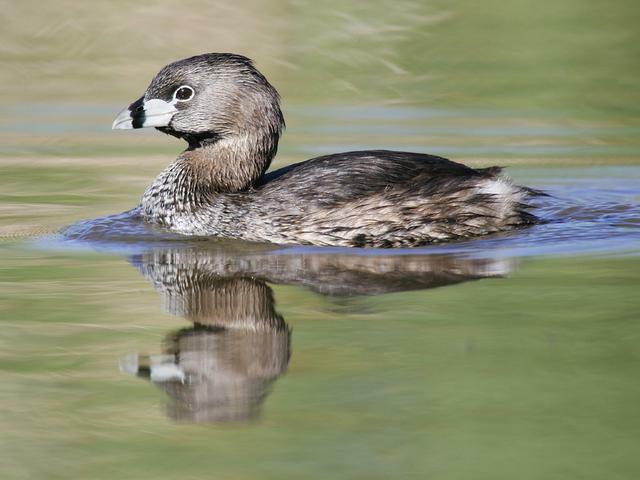 The Pied-billed Grebe is a cute little duck-like diving water bird that can submerge for very long periods of time and pop up in a different spot than it was previously seen in. 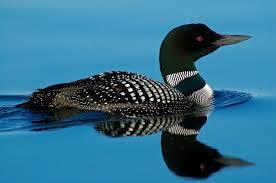 It is a frequent visitor to the lake during migration periods and can be found in both deep and shallow water. It is gray-brown in color with a white behind and a black vertical ring around it’s pale beak. Seen at the lake during migration seasons. 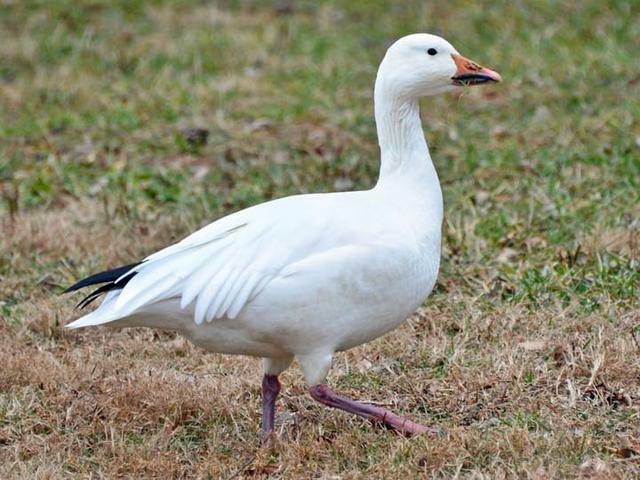 A white goose with black wing tips, pink feet and pink bill with black lip. Immature birds are grey with a black bill. Adults can also be in grey phase but can be distinguished from young birds by the pink bill. America’s Native Swan is a very large White bird in the waterfowl family with a long neck and black bill often with a very small yellow spot near the nostril. Occasional migratory visitor to the lake. Can often be heard before it is seen making a beautiful cooing sound. 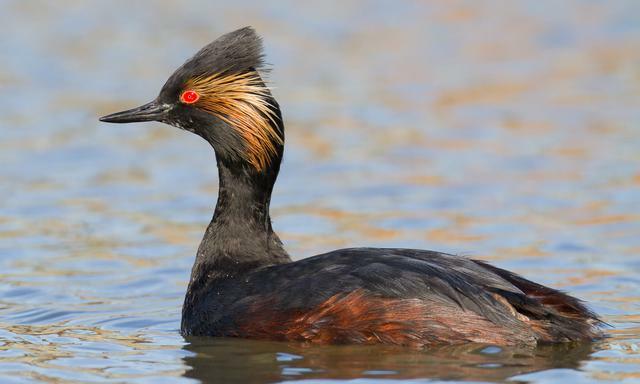 An occasional migratory visitor to the lake in spring and fall, the Eared Grebe is similar in appearance and habits to the Horned Grebe but its predominant coloring is black with a crested black head, golden ear tufts, red eyes, and black neck. Its winter coloring is also similar to Horned Grebe black and white but with a thinner grey neck and more irregular shaped black head cap and grey cheeks. 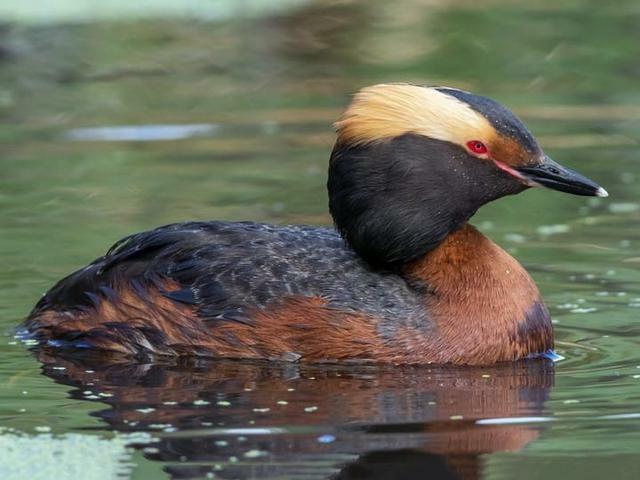 The Horned Grebe is am occasional migratory visitor to Sweet Arrow Lake. 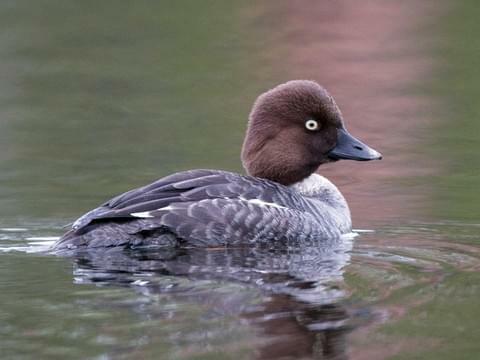 It is a ducklike diving bird with a tail-less appearance, distictive golden ear tufts, red eyes, and chestnut neck. It can be found in both deep and shallow water. Winter coloring – Black and White with a clearly defined black head cap and thin, straight, black bill. The ever present Mallard Duck can be found year round at Sweet Arrow. It does breed and raise young at the lake. Familiar to most folks it has a green head, chestnut breast. Grayish body, violet wing patch bordered in white, and a white tail protruding from a black rump. The beak is yellow and the feet are bright orange. It can be found in all areas of the lake and wetlands. An migratory visitor to Sweet Arrow. The American Black Duck is a marsh duck similar in appearance to female Mallard but can be distinguished by its much yellower beak. 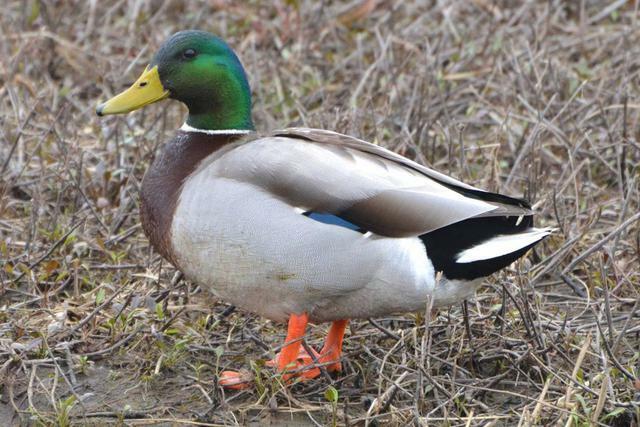 The body of the male is overall dark brown with a lighter head and violet wing patch similar to Mallard but lacking a noticeable white edge. 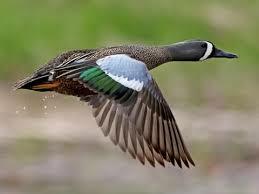 Like the Mallard it is a dabbler feeding from the surface of the water in the shallows or on land. 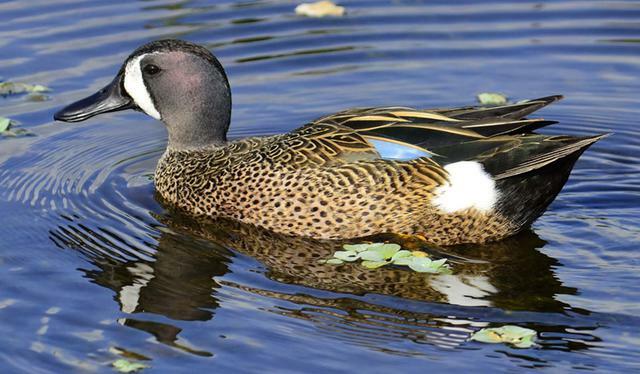 A slender attractive duck, Male with grey flanks, black & white markings on the back, and a long needle-pointed tail. A white point continues from its white breast up the side of its brown head. Female is mottled brown. 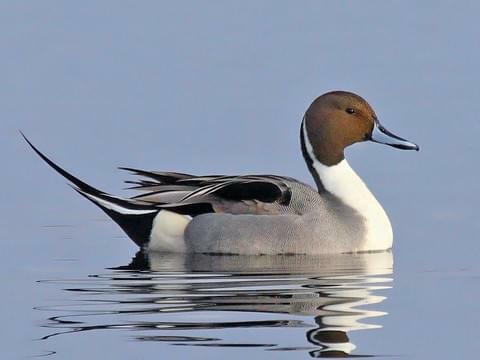 Pintails visit various parts of the lake during migration seasons. 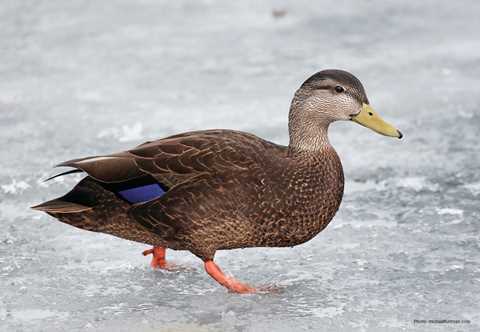 A duck that can be found visiting various parts of the lake during migration seasons. Light brown, dark green head with very noticeable white forehead, rear end black with pointed tail. Last seen at SAL in the mid 1980’s. 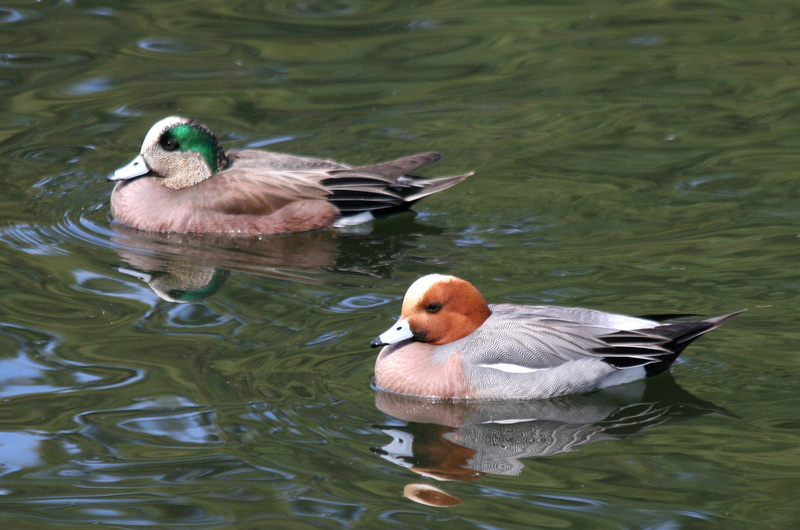 Seen in the picture above next to the American Wigeon it is similar in appearance but with a reddish-brown head, buff colored forehead, and rosier breast. 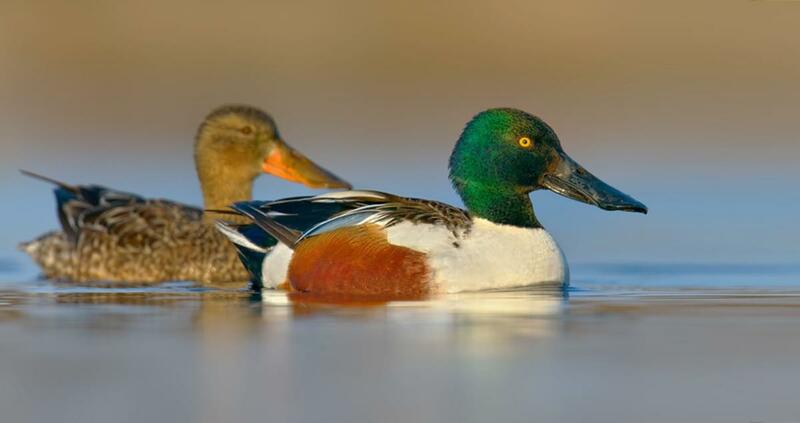 This duck’s most prominent feature is the large black bill that suggests its name. Male has mostly black and white back, green head, white breast, black rump, light blue patch on forewing, and diagnostic reddish-brown sides. 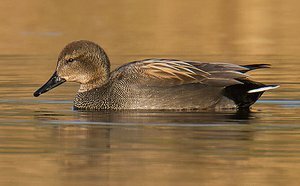 Female also sports the large black bill that sets it apart from other ducks and is mostly mottled brown with light blue patch on forewing. This species is a visitor to SAL during migration seasons and is found mostly in deeper open water. 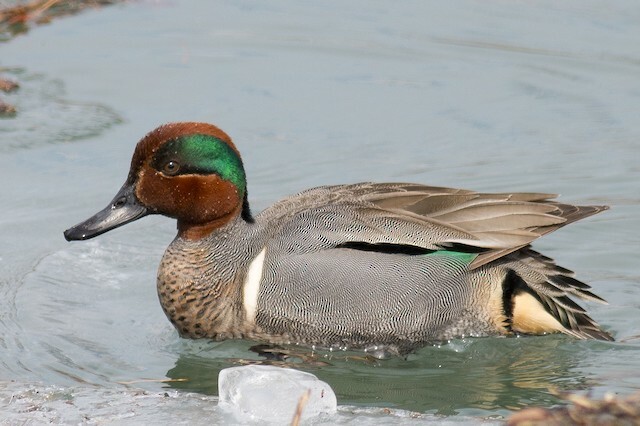 A small marsh or dabbling duck the Green-winged teal is most often found in the wetlands at the east end of SAL during spring and fall migration seasons. Its most recognizable feature is its Reddish-brown head with dark green eye patch that extends to the back of the head. 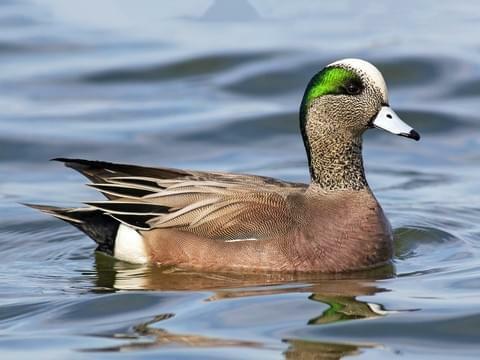 Its breast is mottled brown and is separated from the rest of its gray body by a vertical white streak and sports an iridescent green wing patch (speculum) from which it gets its name. The rump is buff and black. A small marsh duck found primarily in the wetlands at the east end of SAL during migration seasons. It prefers the shallows where it finds food. The male’s most prominent feature is a white crescent just behind the bill. The body is mottled brown with a light blue streak along the edge of the wing that covers most of the inner wing when the bird is in flight. There is a white patch in front of the black rump. Female is overall mottled brown but also sports the light blue streak along the edge of the wing. 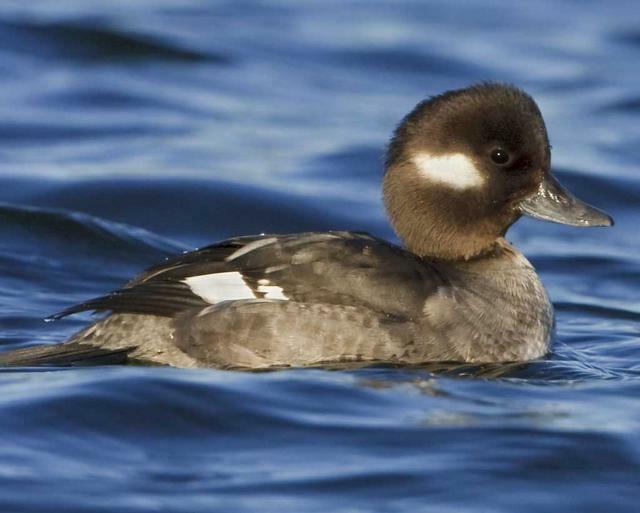 Formerly known as Old Squaw, this now politically correct waterfowl is a sea duck. It dives under the water to catch small fish, mollusks, and crustaceans that make up its diet. Only very occasionally, is this species seen at SAL. Seen during migration seasons, it is usually seen in winter plumage. Male primarily white with black breast, gray and black face patch, light orange patch on bill, and long pointed black tail,. Female gray and white (head darker in summer) and lacking the pointed tail. A diving duck commonly seen during spring and fall migration periods. It can be found on the deeper waters of the lake. Male has black breast and back, gray sides with a vertical white point between the wing and breast, deep purple head, and yellow eye. 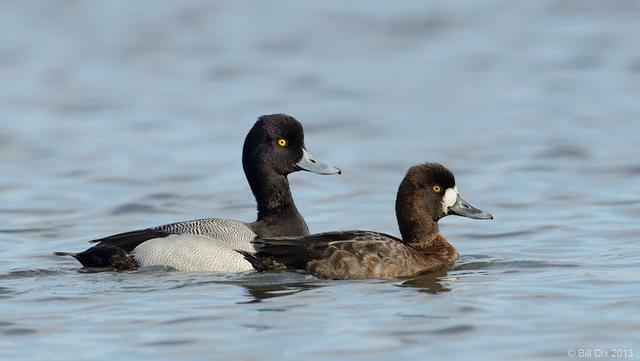 Can be distinguished from Scaup by the white ring on the bill. Female brown with faded white facial patch just behind ringed bill, a white eye ring surrounds a dark eye. A diving duck seen occasionally at SAL during migration seasons. It is found mainly in the deeper parts of the lake. Male is black at both ends, white on the sides with finely barred gray and white back, deep purple head, yellow eye, and bluish bill. 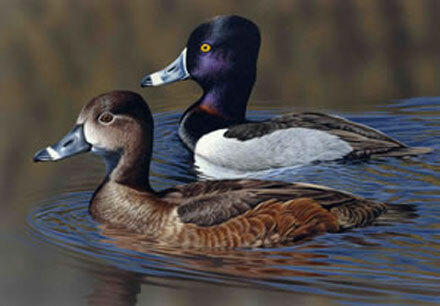 Female is brown and can be distinguished from female Ring-necked Duck by its bolder white facial disk and yellow eye. 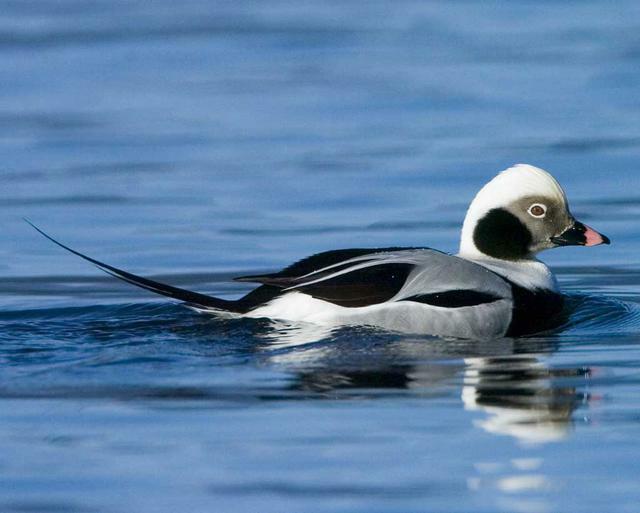 This diving duck is seen often in migration periods at the lake. 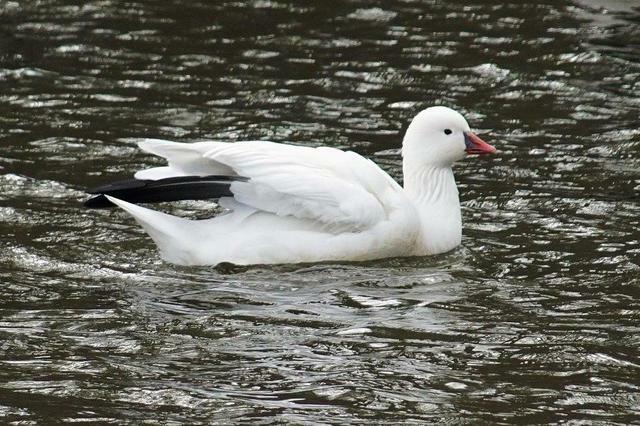 A small duck, the male it is mostly white with black back and puffy black head with large white patch resembling a bonnet. Female is dark brown with white cheek spot and white wing patch. 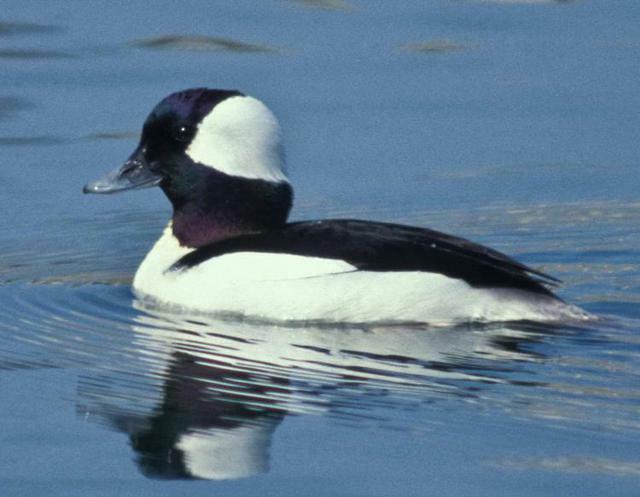 Buffleheads can be found mostly in deep water but do occasionally travel to the shallows. Seen only very occasionally at SAL during migration seasons, this is a diving duck that keeps to the deeper water. Male is mostly white with black back, green head, white spot at front of face, and yellow eye. Female is gray with white collar, brown head, and yellow eye. Small diving duck seen during migration periods in the deep waters of SAL. 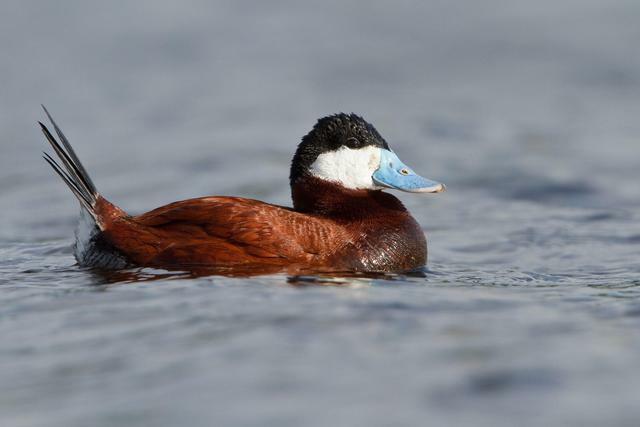 Male has reddish-brown body (turns brown in winter), white cheek, black head cap, and blue bill. It often holds its tail at an upright angle. Female has brown back, gray sides, brown head cap, and white cheek grazed by a dull brown line. 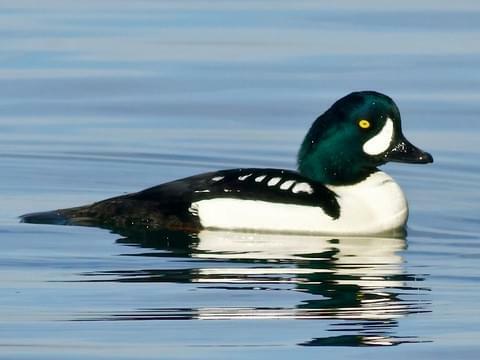 Only very occasionally seen during migration seasons, this diving duck visits the deeper water of the lake and is a bit more colorful than the common merganser. 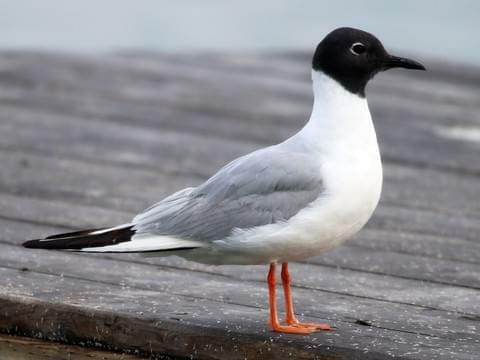 Male has gray and white sides, black back, rusty streaks on breast, white collar, dark greenish –black crested head, a red eye, long pointed red bill and feet. 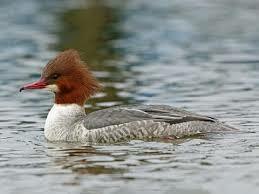 Female is similar in appearance to female common merganser but has slightly longer and more slender neck and slightly smaller head. This long, slender diving bird is a frequent visitor to SAL during migration seasons. It feeds on small fish and can be found in most areas of the lake. 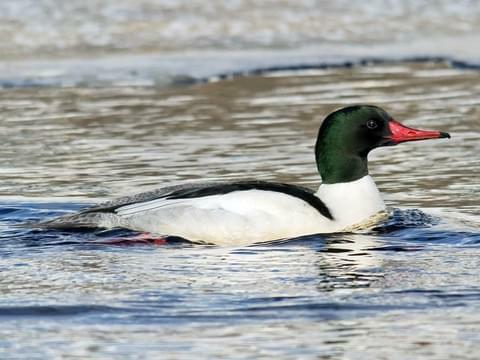 Male is mostly white with black back, dark green-black head, long pointed red bill, and red feet. Female has gray body, white breast and chin, and reddish-brown crested head. This species can easily be differentiated from other mergansers by its smaller size. This compact diving duck often visits SAL during migration periods and although it mostly stays in deeper water can also be found in other parts of the lake. 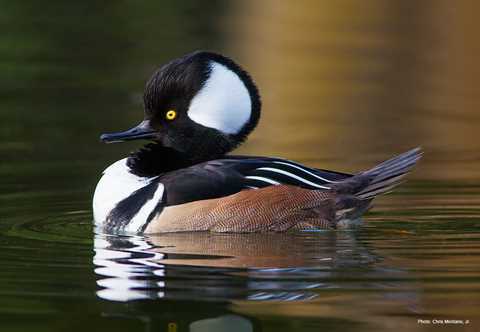 Male is very attractive with chestnut sides, black back, white breast with two black bars, and a black head with fan-like white crest that can be raised or lowered, and pointed black bill. Female is mostly dusky brown with dark back and close cropped, rusty, head crest. Although there have been migratory sightings of this sea duck at SAL, they are unusual. Male is overall dark with white wing patch that is not always visible, there is usually a white spot near the pale eye, and the bill is orange with a black knob at the base. Female is dark. This diving sea duck was seen once at SAL during the migratory season of 2006. 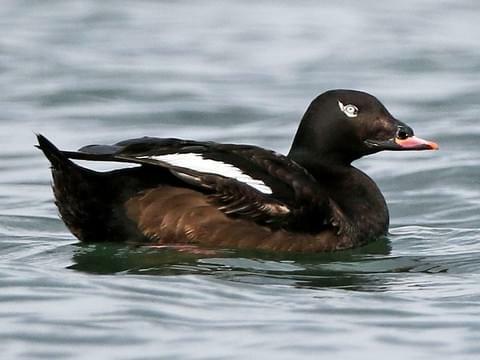 The Surf Scoter is the duck that Picasso built. Male black with one or two white patches on the forehead and back of head. It has a pale eye and large orange, black, and white bill. Female is overall dark including bill and may have two light spots on head. 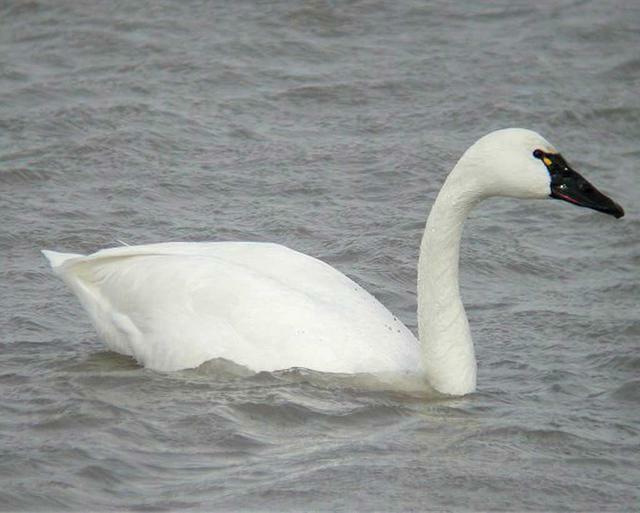 The Trumpeter is the largest species of North American waterfowl with a wing span in excess of 10ft. It is native to northwestern North America. Overall white with completely black beak. Two Trumpeters were seen at Sweet Arrow Lake and other area waterways including a section of the old Union Canal in Swatara State Park for several months in 2017. The birds were banded with numbered collar bands suggesting that they may have escaped or been released from captivity, perhaps, from a breeding and reintroduction program. A small goose with primarily white face, small black beak, black hood, neck, and breast, white sides, and grey back. This may be the only known sighting of this species in Schuylkill Co. The bird seemed to be traveling with a large flock of migrating Canada Geese. It breeds in ne Greenland, Spitzbergen (N. Norway), and nw. Siberia. 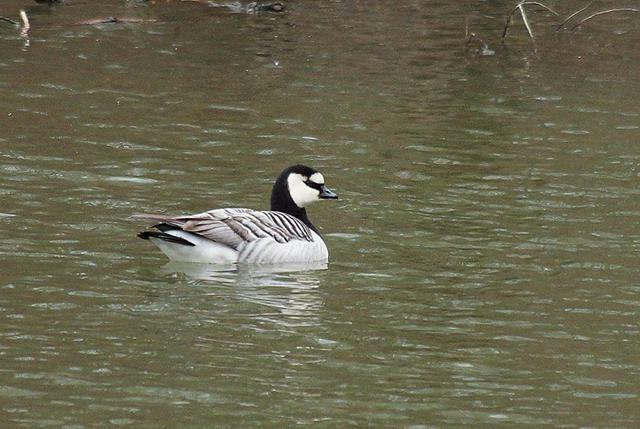 A Barnacle Goose, (possibly the same bird), was sighted 3 days earlier at Peace Valley, Bucks Co. 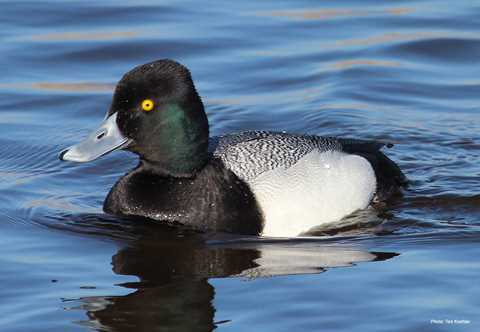 Almost identical in appearance and habit to Lesser Scaup but slightly larger, whiter on the sides, and head is rounder and dark, dull green. This long legged, ducklike bird visits the lake during migration periods. Instead of webbed feet, the Coot has separated lobed toes. When taking flight it seems to run across the water before lifting off. It is both a dabbler and diver and can be found in various parts of the lake. It is overall black with a white patch under the tail, white bill and red eye. Long winged swimming birds that many birders think of as “Sea Rats” because they will eat just about anything. Gulls are often seen at Sweet Arrow Lake very early in migration seasons and can sometimes be seen at other times of the year when the days are warm. They can be seen at most parts of the lake. Flocks of white birds on or in the air above the lake can often be identified as gulls. 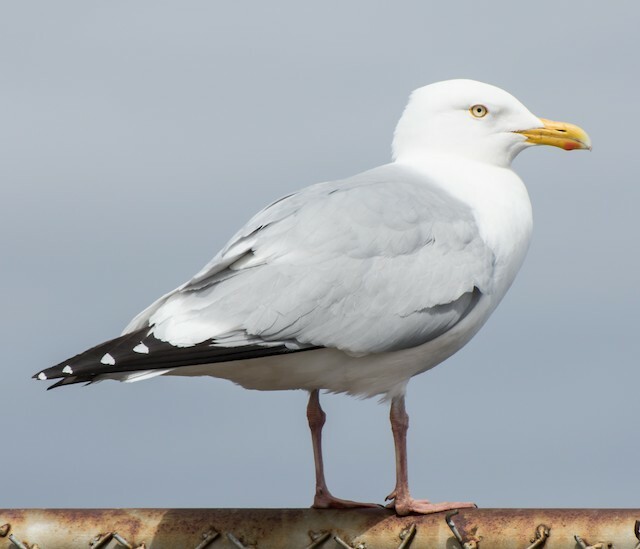 A very common gull with gray back, black wing tips with white spots, pale pink legs, very pale eyes, and yellow bill with a conspicuous red spot near the tip. The gull most often seen at SAL this gull is similar in appearance to the Herring Gull but the main distinguishing feature is the vertical black stripe on its yellow bill. The legs are pale yellow or greenish and the eye yellow. Young birds are a sooty color with gray bill. 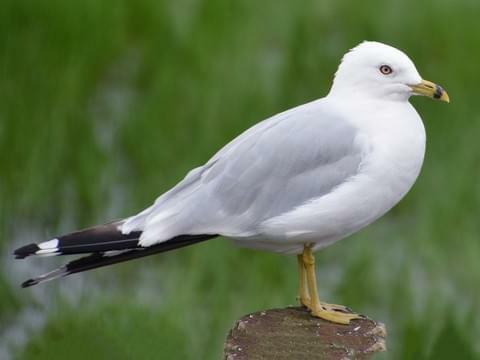 Sightings of this gull are more unusual in our area but they have been seen at SAL during migration seasons. Bonaparte’s is a small tern-like gull. A wedge of white can be seen on the wing tips when the bird is in flight. Its head is black in summer (white in winter). It has a small black bill and red legs. 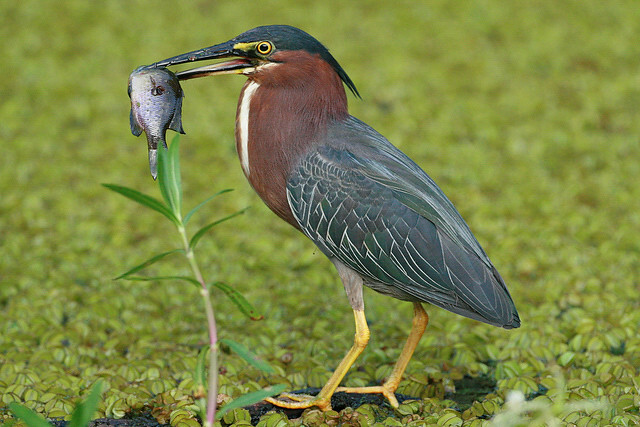 Smaller than other herons the Green Heron is a common species that nests at Sweet Arrow and migrates south in winter. Its back is dark greenish-blue, neck chestnut, legs yellow. Its call is a loud, piercing, single-noted, whistle. 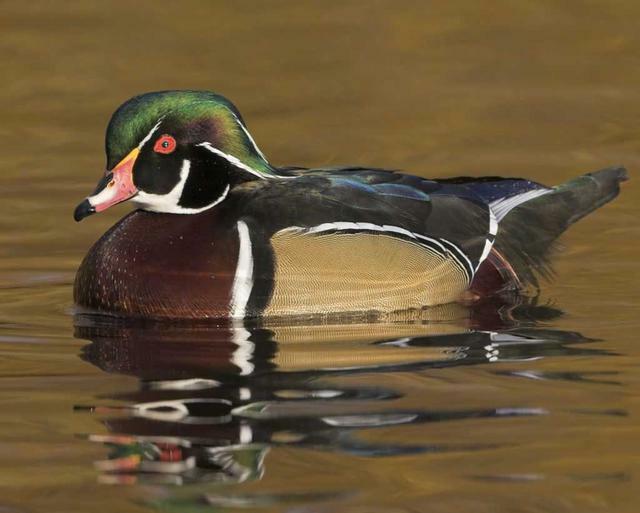 Although it can be found in various locations at the lake, sometimes perching on branches or logs in the water, it is a wader and prefers the shallows where it feeds on aquatic species. Is a rare sighting in this area. Last seen at SAL in the late 1990’s. 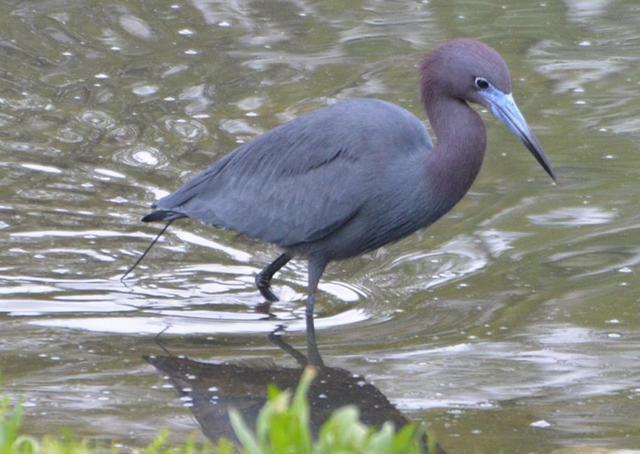 Little Blue is a medium sized heron bluish gray in color with a maroon-brown head and neck, dark legs, and a gray beak with black tip. Immature birds are all white and birds in transition between immature and adult age have a mottled white and gray-blue appearance. 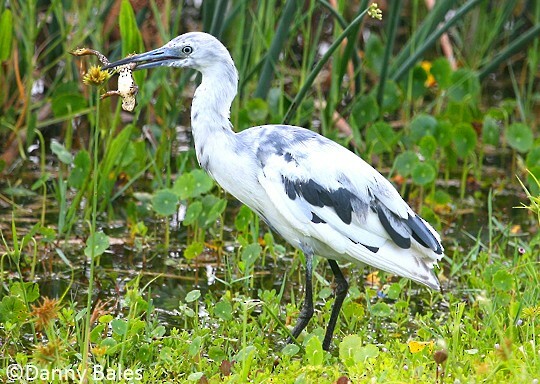 Like all herons, they are waders and, in the 1990’s, was sighted in the shallows near the wetlands. A rare sighting at Sweet Arrow Lake. Last known sightings were in the 1990’s. 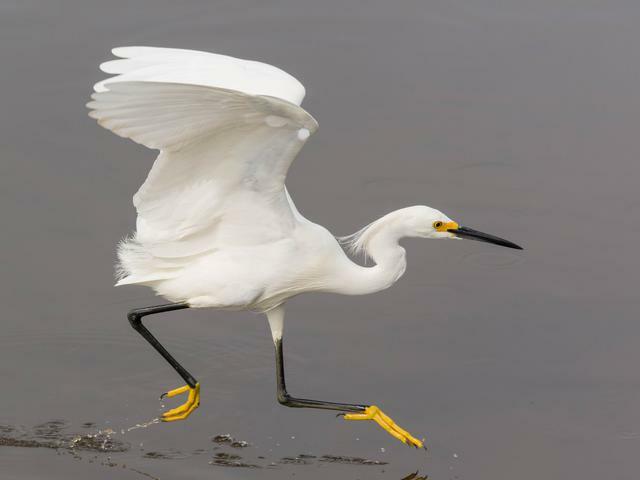 White with black beak and smaller and more “squat” in stance than the Great Egret, its most striking feature is bright yellow feet at the end of black legs. It feeds in the shallows shuffling about to stir up food. Is a tall all white heron with a yellow beak and black legs. Although not a common visitor to Sweet Arrow it is usually seen several times each year during the warm weather months. 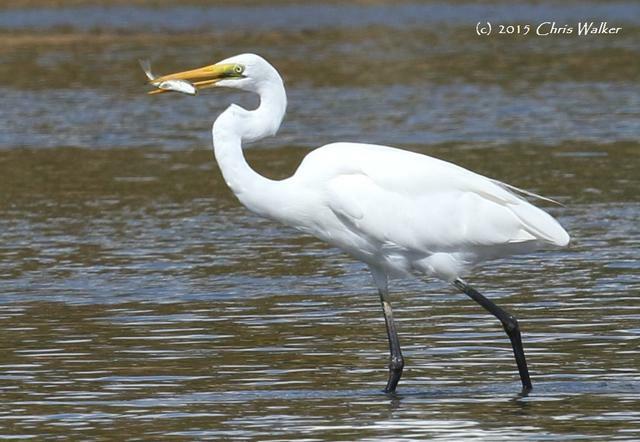 The Great Egret is considered an endangered bird in PA due to habitat loss. Around the turn of the 1900’s it was hunted, nearly to extinction, for its white feathers. 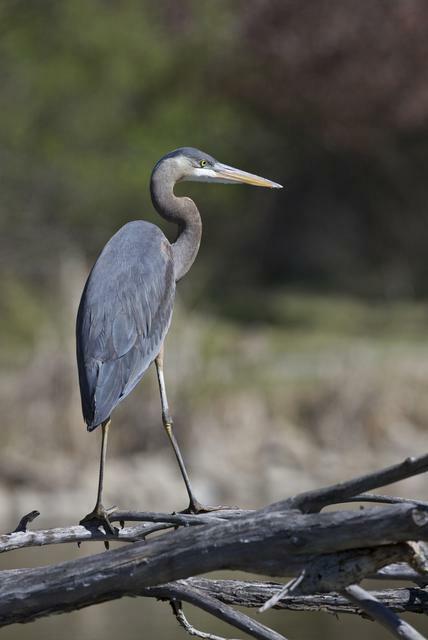 Its feeding habits and sound are similar to Great Blue Heron. Some nesting colonies can be found on islands in the Susquehanna and in coastal areas. A tall slender blue-gray bird about 3 or 4 ft. tall. It has long legs and a long neck which is held in a crooked position when in flight. With its daggerlike yellow beak it spears and swallows fish, frogs, crayfish and other aquatic species. Head is white with a black cap or plume. 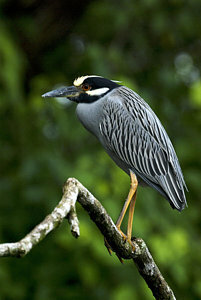 Herons are wading birds and can be commonly found in the shallow areas of the lake. It can be sighted at most times of the year except in the dead of winter when water is frozen. It has a loud, raspy, croaking call. A rare sighting in this area this bird is listed as endangered in PA due to loss of habitat. The largest colony in the state exists on an island in the Susquehanna River. It is occasionally seen on the Swatara Creek from Lebanon Co. south. Only one sighting of an immature bird has been reported in the wetlands at SAL. 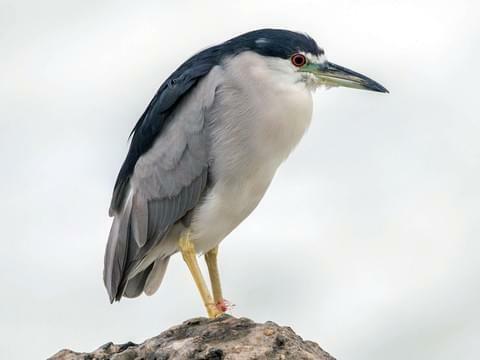 Similar in size and build to Black-crowned Night Heron, the Yellow-crowned has an overall gray body, black head with yellow cap, white cheek patch, and red eye. Immature is similar in appearance to that of Black-crowned but more finely speckled on the back. An unusual visitor to Sweet Arrow this short, stocky heron has only been sighted a few times at SAL. Seen mostly hunched and inactive during the day, it takes flight at dusk to feed. Adult has black back and head cap, gray wings, white breast extending up to cheek, and red eye. Immature brown and white streaked on head and breast and spotted on back. Its call in flight sound similar to a small dog; BARK-bark- bark-BARK. 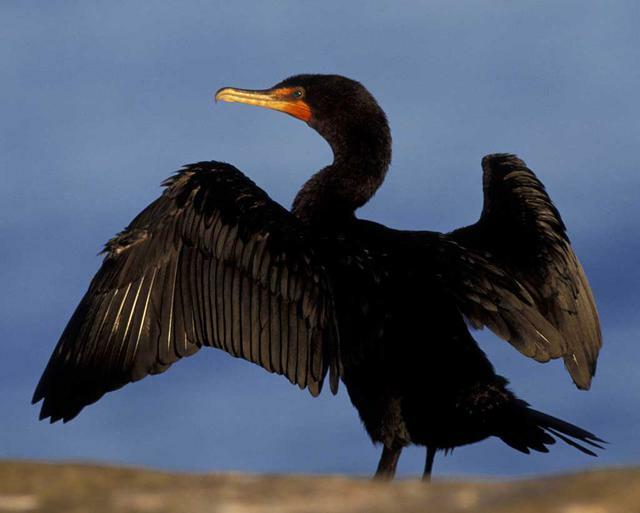 Sightings of this bird in our area are considered extremely rare and accidental. Sandhill is a mostly western species with a small population in Florida. 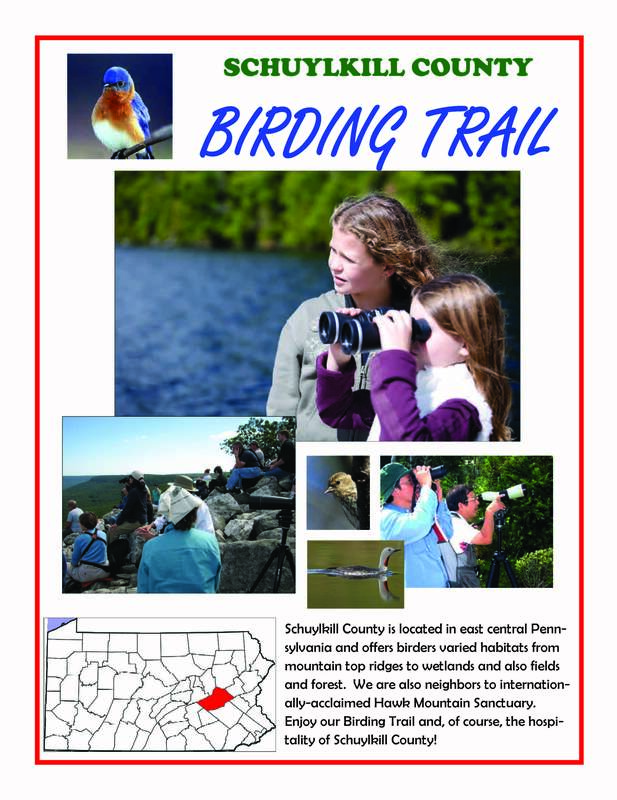 Although migratory fly-overs have been recorded at Hawk Mountain, the only known “touch down” or ground landing of this bird in Schuylkill County occurred here at Sweet Arrow Lake on 3/24/2002 where it remained in the wetlands for several days. It is a very large bird 40 – 48” in height with a wing span of 6 -7 ft. 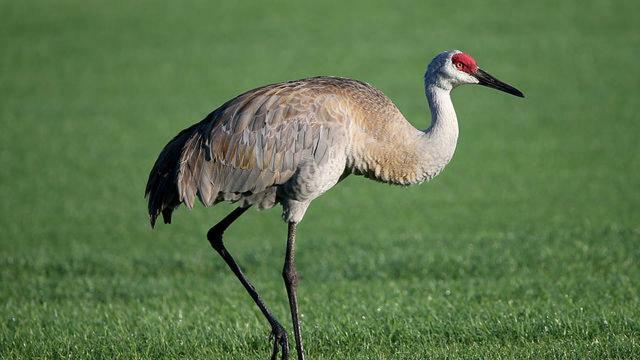 It is overall gray, often stained with rust, and has long neck and legs, a red cap on the forehead, and a white cheek patch. Its call is raspy and stuttering.